Working with several hundred City Heights volunteers this neglected parcel was transformed into the Manzanita Gathering Place. On a minimal construction and materials budget and quick time frame, this degraded site was transformed into a unique, culturally rich and ecologically integrated and generative space treasured by the community. Neighbors, business owners, schools, community artists, non-profits, contractors, and representatives from the City of San Diego worked together to transform this misused space into a safe gathering place, celebrating local culture and identity, and improving the overall ecological health of the area. Using a participatory design process, engagement included an intensive week of community input and design workshops, community art making days, design development, permitting, budgeting, material procurement, and a 4-day community build. 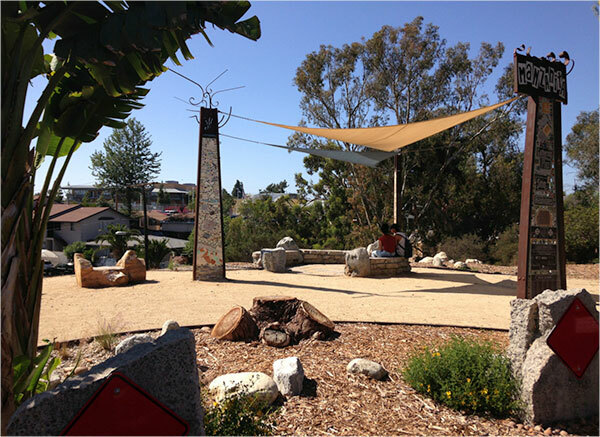 The site of the Manzanita Gathering Place is a 1,500 square foot lot, sitting within ¼ mile of 4 schools and surrounded by residential and mixed-use development in the urban community of City Heights. Owned by the City of San Diego, this undeveloped paper street served as a dumping ground for old electronics, furniture, shopping carts, feces and needles. The heavily degraded lot was filled with invasive plants, overgrows brush, and eroded slopes. Additionally, a barricade of razor wire fencing prevented access by the neighborhood, supporting encampments of drug users, and hindering ecological health or veneration of the adjacent Manzanita Canyon trail system. Although small in size and budget, the Manzanita Gathering Place is considered the first step in restoring the overall environmental integrity of this neighborhood. Not only was the goal to improve the ecological health of the site, but also to serve as a teaching tool and resource to promote ecological literacy in the community. The design responds to the local community and it’s ecological identity. Materials are repurposed, made of recycled content or from local suppliers. The new low water, native plants support the flora and fauna of the adjacent canyon while reducing storm water run-off and erosion. Sitting at the head of the Manzanita Canyon Trail system, this site now serves as a meeting place for community cleanup and restoration events. Project Consultant, Pomegranate Fellow, Project and Construction Management, Community Facilitator, and Designer. The Junior League of San Diego, Malin Burnham San Diego Center for Civic Engagement, Community Housing Works, Carey Construction and Design, CM Emerald, and San Diego Canyonlands.